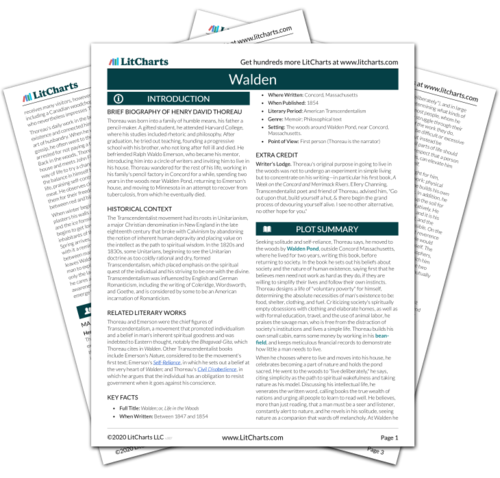 Instant downloads of all 945 LitChart PDFs (including Walden). 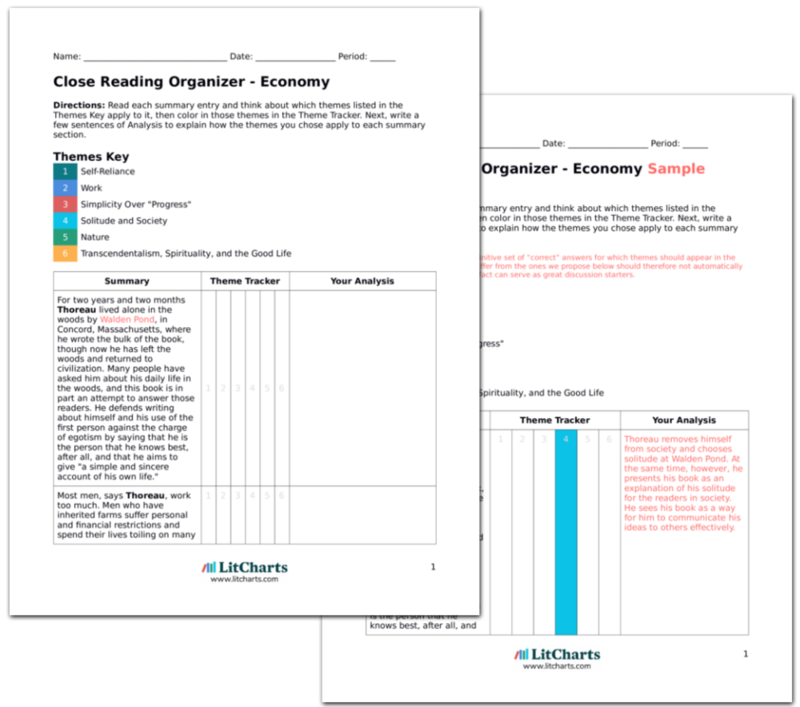 LitCharts assigns a color and icon to each theme in Walden, which you can use to track the themes throughout the work. Thoreau writes that there were "shrines" he visited in the woods, pine groves and other groups of trees "standing like temples." Once, he found himself standing in the end of a rainbow and compares his intense feeling of being dazzled to a feeling described by Benevuto Cellini who, after a nightmare, woke up to see a strange, alluring light over the shadow of his head. Thoreau approaches nature with religious passion. Like Cellini's memory, his encounters with nature are to him the most intense and important kind of experience possible. Once, while Thoreau was walking through Baker Farm, he says, it began to rain, so he went into the nearest hut, where he found John Field, an Irishman, and his family waiting out the storm. Thoreau describes John as honest and hardworking but unambitious. When Thoreau describes his simple, independent existence to John and his family and tells them that they do not have to work hard to support themselves but can escape the big expenses that trap them, they see what Thoreau describes as a difficult life to maintain and are not interested. As Thoreau leaves the hut, he says his "Good Genius" seemed to celebrate his adventures and independent spirit and urged him, "Grow wild according to thy nature." For Thoreau, John Field is a man who belongs to society and is afraid to try out the lifestyle that would free him from the constraints that make him unhappy and trap him in a life of debt and excess. Thoreau's encounter with John leaves him feeling elated in his independence and recommitted to his lifestyle, which allows him to enjoy the finer fruits of nature. Saviano, Andrew. "Walden Baker Farm." LitCharts. LitCharts LLC, 15 Sep 2013. Web. 29 Jan 2019. Saviano, Andrew. "Walden Baker Farm." LitCharts LLC, September 15, 2013. Retrieved January 29, 2019. https://www.litcharts.com/lit/walden/baker-farm.